This is the EMD F40PH Amtrak Phase III with Ditch Lights diesel locomotive from Kato. Designed for use in Amtrak's inner-city lines, the F40PH series of locomotives was ordered as a replacement for the EMD SDP40F type, Amtrak's first series of locomotives built new for them since its inception in 1971. Following updates in federal regulations in 1997, Amtrak’s fleet of F40PH locomotives were upgraded with ditch lights (low mounted headlamps that help alert street and walking traffic to the presence of oncoming locomotives at grade crossings), which this particular model replicates. 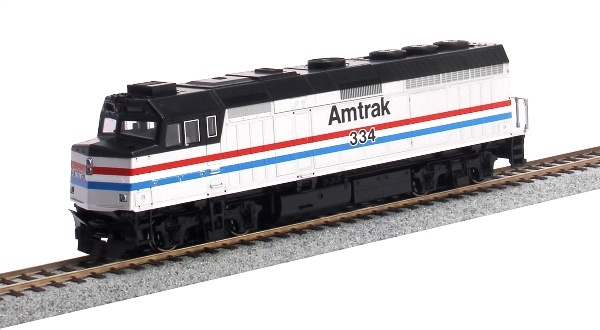 The new Amtrak Phase III F40PH has a number of new tooling modifications from its previous incarnation, such as new cab air conditioning units and illuminated, inset ditch lights to represent the later appearance of this Amtrak locomotive. Perfectly suited to pull Kato's HO Superliner and Amtrak Bi-Level cars.